When the Aztec Center was torn down, a concerted effort saved the distinctive Back Door Mural from the bulldozer’s blade. This mural was located on the lower level of Aztec Center in the hallway north of the Back Door. It was painted in 1976 by Arturo Anselmo Roman and students in his Chicano mural art class. 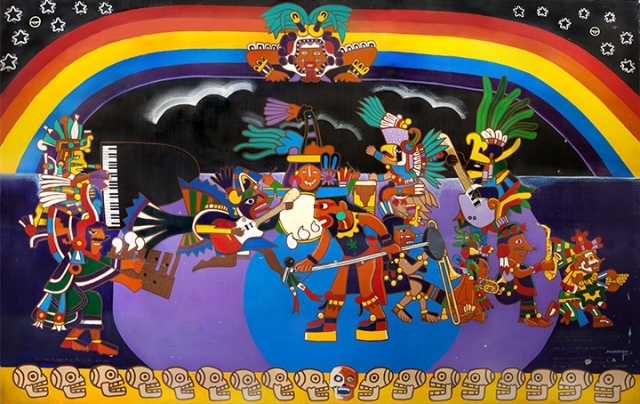 The mural is dedicated to the Aztec god of music. The design includes a pianist, marimba singer, guitarist, bass player, vocalist, trombonist, trumpeter and flutist. The mural has a large rainbow of stars and planets on each side, and a row of skeleton heads, representing the celebration and humor of life along the bottom. The mural's inscription reads: "May this mural bring you peace of mind." The Back Door or Rock 'n Roll mural is the library’s third restoration project. The first phase of this project took the mural off the wall and stabilized it. Now we need to finish the project. It will be conserved and mounted on a frame. Once restored it will be moved to the library for permanent display. The Rock 'n' Roll Mural is the latest conservation project to be undertaken by the Library & Dr. Seth Mallios, Anthropology department chair. Also called The Back Door mural, it is a historic connection to the campus of the 1970's - a time of great sounds. Musicians like Bob Dylan, Joan Baez, Ray Charles, Jimmy Buffet, Canned Heat and the Ramones played at SDSU. This mural is a connection to those times and the ongoing history of rock 'n roll at SDSU. Check out Dr. Mallios' book Let it rock! : live from San Diego State for more information about SDSU's concert history. And be sure to look at the great article about our event in the SDSU NewsCenter, with a video of Dr. Mallios talking about SDSU's music history! Supporters include: The Associated Students, College of Arts & Letters, Aztec Parents, SDSU President Emeritus Stephen Weber and Susan K. Weber, Enterprise Holdings Foundation, Wells Fargo Wealth Management, and the Alumni Association. With their donations, we are nearly to our goal. SDSU students are counting on you to bring this mural to the library. Every dollar counts. Show your Aztec Pride and give today.